Разстояние до летището 16,1 км. Ако това, което търсите е хотел с добро местоположение в Джохор Бару, не се колебайте, а изберете i-Hotel @ Johor Bahru. Оттук гостите имат лесен достъп до всичко, което този оживен град може да предложи. С удобното си местоположение хотелът предлага лесен достъп до всички градски забележителности, които задължително трябва да се видят. В i-Hotel @ Johor Bahru отличното обслужване и достъпните съоръжения допринасят за Вашия незабравим престой. За удобството и комфорта на гостите хотелът осигурява 24-часов рум-сервиз, безплатен WiFi достъп във всички стаи, 24-часова охрана, ежедневно почистване, таксиметрови услуги. Като допълнение всяка хотелска стая предлага широка гама от удобства. Много от стаите са с телевизор с плосък екран, достъп до интернет (безжичен), безжичен интернет достъп (безплатен), стаи за непушачи, климатик, за да удовлетворят и най-изискания вкус. Освен това в хотела можете да се възползвате от множество предложения за приятно прекарване на свободното време. Насладете се на несравнимото качество на услугите и престижното местоположение на i-Hotel @ Johor Bahru. The room was superb till i felt a little regret as i just can spend one night only. Will book this hotel again whenever i go to JB. We totally not happy at all in like Hotel.. I check in Hotel midnight at2am but in the room nothing. Very disappointed Hotel. Please take Noted and Change it.. The 2 Malay staff are sleeping in the Sofa there. The night I go down and ask her why is nothing in the room than she give me a stupid answer.. That is All finish ready bcz Ydy so many people tats why ur room don’t have.. How come simply can answer me.. I pay money not they give me Free. Hopefully coming future change it.. Agoda please take the review and feedback. AnywayTQ..
Kindly make sure water heater working or not for all room.. that day when I check in at 6pm then when try to take shower water heater not in use when I call front office to inform this they say no maintenance after 7pm.. whole day I shower in cold water.. please put maintenance on standby or else check all your rooms weekly basis.. Took us almost 20 mins going around & around the vicinity, looking for the hotel when it was just along the main road! Bad info given - hotel name differently spelt in the Booking Form, in the Internet and in Waze .... by the time we checked in, it was almost midnight....!! Staff on duty not trained and not professional in their presentation. Difficult to locate the hotel! Using Waze, we were given the "merry-go-round" looking for the exact location and correct name of the hotel. The staff on duty have this "oh well, whatever...." attitude, they were sleeping on the sofa in the Reception area when we saw them the next morning! Reception area was scrumpy and not well-maintained. Good location, a lot of eatery nearby. Value for money, good receptionist helping us when our room aircon is not able to be turned on. However cleanliness and facilities can be improved. For a one-night stay, this place was perfect. I felt safe having my car parked outside as the police station was just next door. No breakfast served but there are plenty of food options along the street. Worth the money spent if you need nothing more than a good night's rest with peace of mind. This is one of my favorite hotel I will rent if I had to go there for my business purpose. 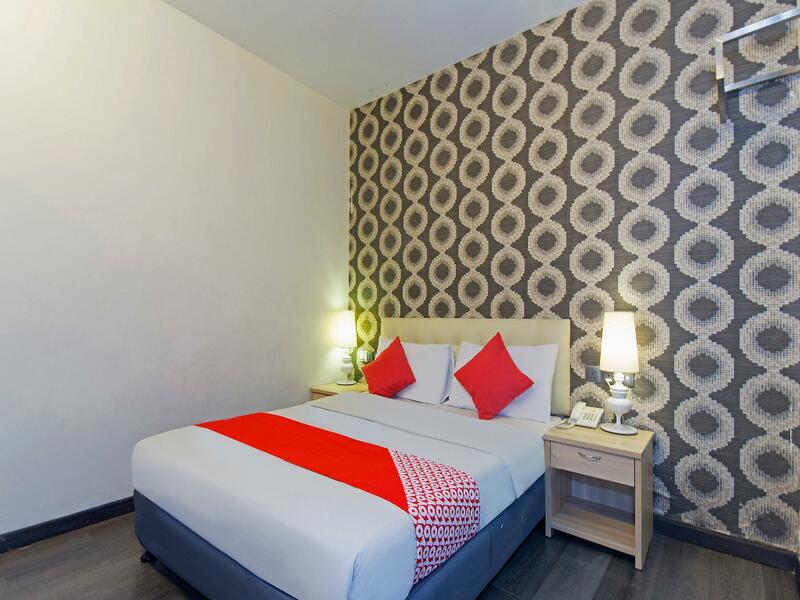 Overall im satisfied with the hotel as its very clean, big room with more space for you to move around with a cheaper price. The only thing maybe management could improve is to provide lift so its easy for your customer if they need to stay at your upper room. I find its difficult for me to bring all my things from ground to level 2. Keep it up! Very strategic place, more restaurants nearby, for solo travellers especially for woman’s, it’s a very safe place as the police station is just 2 shop lots away. There’s a clinic beside too. Near to Aeon Bukit Indah. The room is comfortable, the toilet is clean. The location of the hotel may not be the upper class location but it has all the things you need like food and convenience stall. Apart from the nice comfortable room, the nearby food stall which is 5 minutes walk from the hotel has one of the delicious Gui Chap (a dark soya braised pork and intestine) and the a Vietnamese stall that serves food that could match restaurant. No complaints about the stay as it was for a night and on business - bed was cozy and two of us men stayed in a spacious Triple Room. Too bad the hotel has no on-site restaurant but not an issue, since there are loads of restaurants in Bukit Indah and Taman Perling! The other thing is the non-availability of WiFi during our stay here, something that we hope management will generously provide, as it's a near-requirement for any business hotel today. This is my 2nd time back to this hotel, when l travel to JB for short business trip. Lots of food nearby, so no worries on your stomach. The shower is strong, and it makes you feel fresh. Only set back is the wall is too thin, you may hear next door snoring at night. The hotel and room is very clean and comfortable. Feel safe as the police station just few shop lot away. 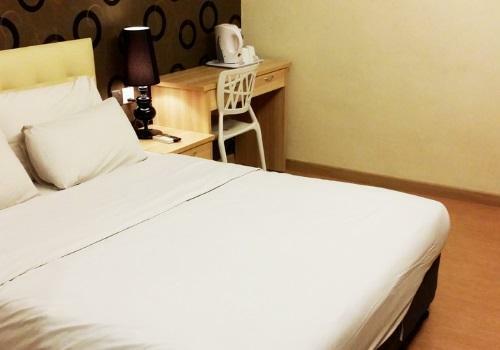 Convenient for me as kettle and Wifi is available in the room, bathroom is also very clean with powerful ventilation. This is the best hotel I have stayed so far. Was ok but the problem for this room booking it never stated Single Bed or Double.I booked and request online for 2 beds but they gave me King Size Bed.Toilet was clean but still have a strong stench smell.Stairs to 3rd floor very high and not old folks friendly & no lift inside . Its was good to stay just 1night because we had trip to legoland so check in late just wanna sleep. Need to improve the sound proofing and more sensitive to muslim to show qiblat sign n sejadah.and also if the hotel could provide tea/coffee sachet at the desk that much more great! Overall i give 7/10 score.